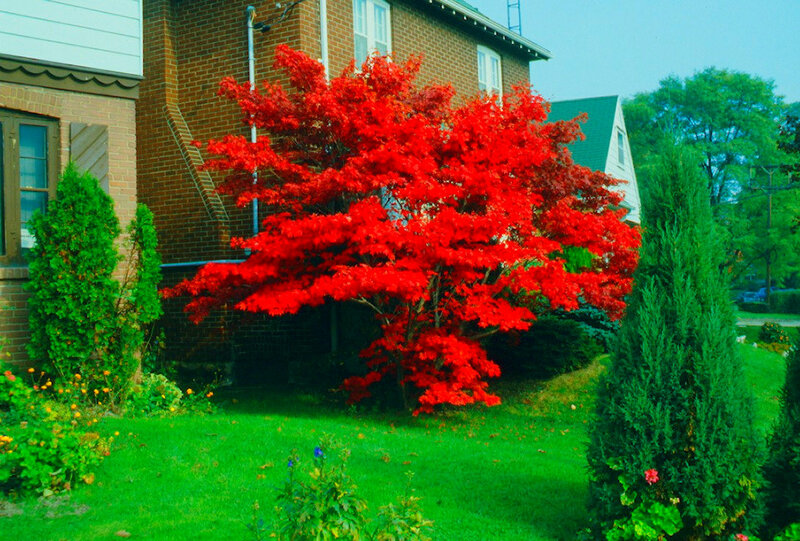 Above, for small lots dwarf or smaller trees are generally better than larger ones such as lindens (Tilia), maples (Acer) or oaks (Quercus). This first shot is of a white flowering crab-apple on a very short stem or standard; an exception to what I said about maples are the Japanese maples such as this one in its glorious fall garb which grows on an East York street near where I lived; this too is a Japanese maple a cut-leaf cultivar that turns bright orange for the autumn but even during the entire summer looks great due to the cut green foliage. 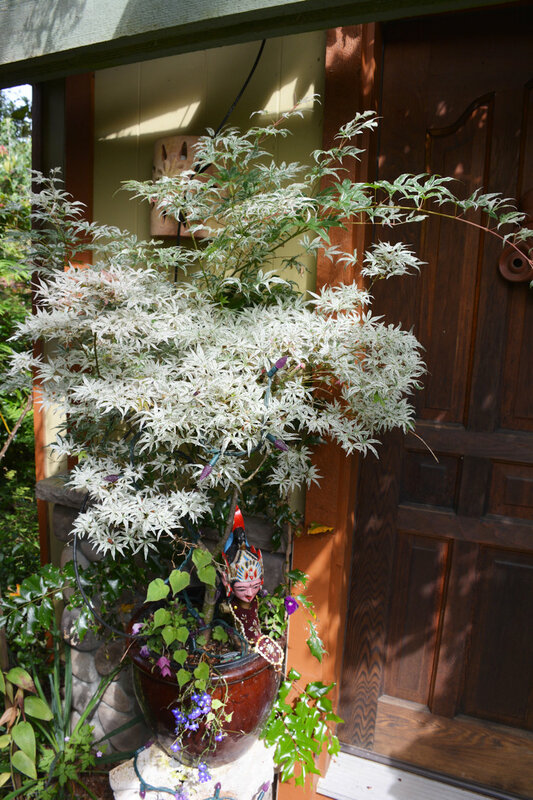 Below, still another of our Japanese maples, this one with variegated white foliage, and not as hardy as the others; and finally a Japanese dogwood tree (Cornus kousa)—a nice small tree—in full flower at late spring. Author photos. A friend in broadcasting once sent an e-mail that prompted me to write the following piece, which I first forwarded to her. Here is what she said: "We would like to do some landscaping (other than having a lawn) but Darren and I know absolutely NOTHING about flowers, plants, trees, etc." Your dilemma as new homeowners is not unusual. Here are some suggestions. First choose a garden centre/nursery operation that you like, and where the senior staff seem well informed. A couple of ways of ascertaining that are: first, senior staff members at least should have, or be about to have their "CCHT" (Canadian Certified Horticultural Technician) designation. Second, when you ask questions, does the staff always seem to have the answers? If they do, then they're probably faking it, or making up replies that are likely not correct, or may be entirely false. No one has all the answers in this business. Staff at good garden centres call upon one another all the time for information on topics about which they're not certain, or about which they may not even be aware. The better garden centres often have an in-house communication system that allows all staff to ask a question and anyone who knows the answer responds. If there is more than one response, and they are diametrically opposed, you shouldn't be surprised. That's when it’s up to you to research further to get the correct answer, or an explanation of the varying views. The "art" of gardening and growing plants is just that, and generally there are few hard and fast rules. I always tell people that if they are doing something a certain way, and they happen to hear or read of me saying something completely different, they should not change their method unless theirs is not working well. If it works don't change it. There is another caveat in this regard as well. That would be if your method of doing something uses more resources, involves use of a strong chemical, or is more costly, then if my suggestion is superior in one of those areas, you might also consider changing your method. Once you've chosen a garden centre after having visited at least three of varying sizes (they don't necessarily have to be close to your home its more important that they have a wide range of plants and products, and that their staff is knowledgeable), it’s time to get started. That is best done by taking a whole range of colour photos of your existing front and back gardens, showing the house, neighbours gardens/homes, and any specific "problems" such as utility poles, hydrants etc. You should also prepare a list of what you think you want and don't want. For example, do you want the patio/deck area enlarged, a swimming pool, a vegetable garden, a children’s play area (even in the future), rose bushes, perennials, a water pond, and how much screening of your neighbours in the back garden? The single most important element(s) is a tree or trees. They should be planted first, but not without a completed plan. In the off season, i.e. from the end of June through the summer, most garden centres will be able to prepare you a basic plan that will not cost much (likely under $100). With their advice you will need to decide where to plant trees for shade and screening. Choosing trees is a fairly involved process. I always suggest having a look at a local arboretum, even if it is not formally known as one. For example, in Toronto, Mount Pleasant Cemetery is one of the best in the country. In an arboretum it is possible to view a wide variety of trees (with nearly all of them labelled) that have or almost have reached maturity. That's important. If you are able to talk to a knowledgeable horticulturist or arborist about your initial choices, that's even better. Again, the more input you have, the more likely that you'll be happy with your final landscape design. Once you've decided on your trees (one for the front and at least one for the back?) 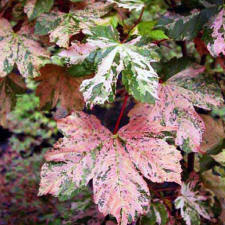 check to see if they are available for planting in the summer, and what guarantee the nursery will supply. Late autumn, just before freeze-up, is one of the best times of the year for planting most trees in the milder parts of the country. Also regarding trees, if you have a little bit of budget, it is possible to purchase large specimens of a few types of tree, either from a nursery, or a large tree supply specialist. 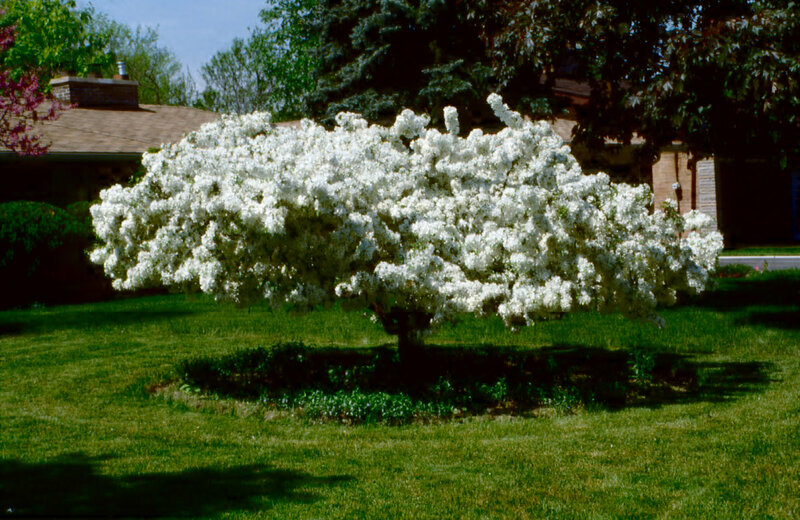 Many new homeowners want a tree especially for the back garden, that will give them shade in just a few years, rather than a decade or more, and that can only be done by purchasing a larger specimen. If you decide to go this route, and haven't got fencing in between your neighbours, then hold off on the fence so the tree can simply be delivered without the use of an expensive large crane! Some nurseries may be reluctant to advise on the location of tree farms, but questions to individuals in garden centres, or parks department officials nearby should bring you the information.